Maal Gaadi is your go-to store (also available online) for its collection of all kinds of indie, made in India goodies (across 85 brands!) from the cutest nose pins to Men’s vintage shoes and even Balinese benches! They have it all, quite literally. Located in Besant Nagar, it’s impossible not to notice the two-story Maal Gaadi stone building (raw but classy). As you enter through the large wooden doors, it’s a colour poppin’ paradise. What greets you is a quirky cart filled with goodies like gorgeous, so-not-your-everyday jewellery by Kriya and shoes fit for a lady boss. We found these cool Silver and Neon Pointed Heels by a.k.a bespoke. The ground floor houses a host of things including quirky apparel. Take your pick from brands such as Soup by Sougat Paul, Urbane Label (winning for funky cowl maxis and draped skirts), and fun, contemporary designs by Nida Mahmood. You can find amazing merch by designers like Gargi Guptha and Siddharth Vansal. There’s also bow ties, and even luscious shampoo bars from Neemli and sweet-smelling pillow mists by Hedonista to pick from. On the floor above you can browse through fun posters (the Shiva Pop Art by Art Lab is our pick), a few hilariously named sunglasses (do try on the Mr. Lova Lova or Iron Man’s Junk by Go Spiff) and more. Wait, there’s more! After all, you have 85 brands to browse through. Expect pop-culture merchandise from Graphicurry, statement jewellery by Eesha Zaveri (loved by Bollywood divas), and apparel from Quirkbox. The store’s inventory is curated by designer duo Shreya Kamalia and Vivek Karunakaran, and inspired by travel and fashion. 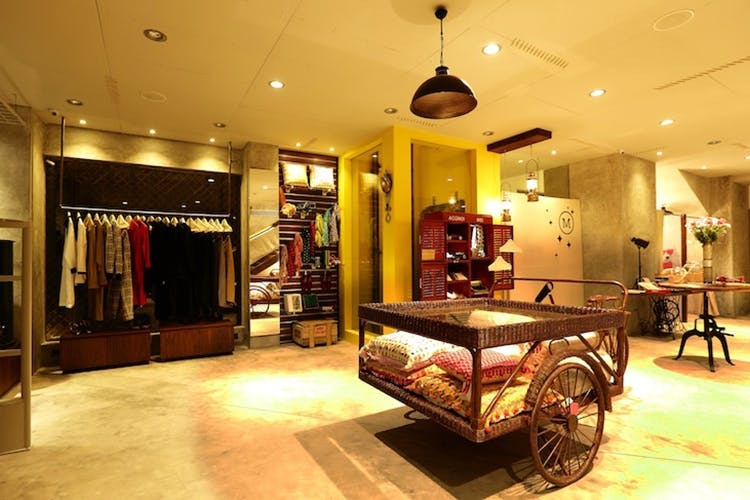 Maal Gaadi also organises trunk shows at least twice a year with new designers on board.